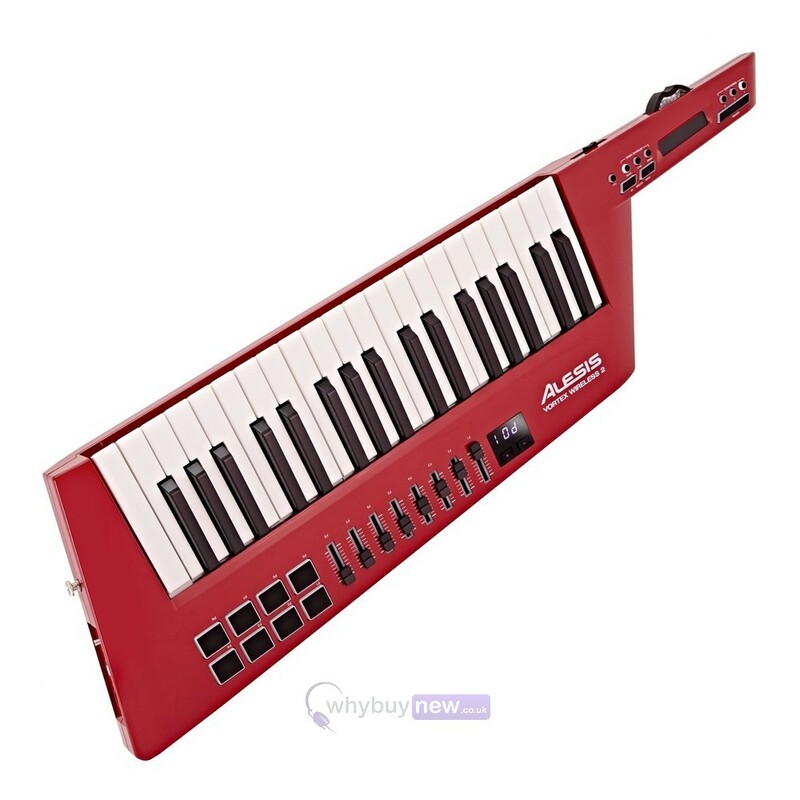 The Alesis Vortex Wireless 2 is a USB/MIDI keytar style controller that includes several professional production software items including Ableton Live Lite and Hybrid 3 which will enable you to start creating music in no time at all. Check out below all the software packages it includes! The Alesis Vortex Wireless 2 features 37 keys, 8 RGB back-lit trigger pads and 8 back-lit faders, all of which will aid you in your music production. Take back the stage! Experience untethered keytar performance with the next-generation Alesis Vortex Wireless 2. Featuring improved ergonomics for better playability, a more durable housing, and an updated control layout, the Vortex Wireless 2 offers comprehensive MIDI controller functionality in a stylish and stage-ready keytar design with a stunning gloss-black finish. This dynamic MIDI keytar controller connects wirelessly to your computer and easily integrates with popular virtual instruments, plugins, and DAWs. For maximum stage and studio mobility, the PC and Mac-compatible USB dongle uses a single USB port to establish an ultra-reliable, road-ready wireless connection. With Alesis Vortex Wireless 2, create dynamic, expressive performances that every audience will appreciate. Command the stage with 37 velocity-sensitive keys with after-touch, 8 RGB back-lit velocity-sensitive drum pads, and a row of 8 MIDI-assignable back-lit faders, all laid out in an accessible, hands-on design. A series of neck controls provides additional performance options: you can tweak sounds using the MIDI-assignable touch strip and MIDI-assignable accelerometer, expand melodic ideas with the octave range buttons, and activate sustain, all while your right hand remains free to play. Vortex Wireless 2 offers multiple connectivity options and comes equipped with USB-MIDI and traditional MIDI Out jacks. With Vortex Wireless 2, a comprehensive assortment of accessories is thoughtfully included for Immediate performance right out-of-the-box. With a strap and cable harness included, plus conveniently located standard guitar strap pegs on the neck and body, Vortex Wireless 2 has been meticulously engineered with one goal in mind, liberated performance capability. Vortex Wireless 2 includes premium bundle of virtual instrument plug-ins, including Hybrid 3, Loom 2, Vacuum Pro, and Xpand!2 from AIR Music Tech, and TimewARP 2600 by Way Out Ware. For performing, producing, recording, we include Ableton Live Lite. Finally, we include a clear, concise, andeasy-to-use point-and-click preset editor, so you can quickly configure any parameter of any preset. You can also use the editor software to save and load all of your Vortex presets to and from your hard drive for easy backup. Ableton Live Lite one of the most popular performance and production programs available in the world. A powerful music creation tool, Ableton Live Lite enables musicians and producers to spontaneously compose, record, remix, improvise, and edit musical ideas in a fluid audio/MIDI environment. Explore sonic possibilities in real time whether on stage or in the studio. When you are satisfied with your work, Ableton Live Lite lets you save it or mix it down. Hybrid 3.0 is the next generation in synthesis. This high-definition virtual synthesizer combines the coveted warmth of analogue synths with a full range of futuristic digital manipulation capabilities. The result is the best of both worlds a virtual instrument with a comprehensive set of precisely adjustable parameters that can sound like a synth you remember or something no one has ever heard before. Vacuum Pro is a polyphonic analogue synthesizer with vacuum tube circuit modelling that perfectly captures the crunchy, warm sound of the analogue era. With four analogue oscillators, multiple filters and envelopes, and built-in audio effects, Vacuum Pro lets you dive deep into subtractive synthesis to recreate those sought-after analogue sounds from the 70s and 80s. Tweak the switches, knobs, and dials to program anything from basses, leads, pads, or unique sound effects. Xpand!2 is a multi-timbral workstation offering four active sound slots, or parts, per patch. Each part is provided with its own MIDI channel, Note Range (Zone), Mix, Arpeggiation, Modulation, and Effects settingsan excellent method for creating individual parts. Harnessing the four parts together to build one amazing Patch is where Xpand!2 reveals its true power. Using everything from wavetables and FM synthesis to sample playback, the expert sound design team at Air Music Tech has carefully created thousands of ready-to-play Xpand!2 patches. Way Out Ware presents the one and only ARP 2600 emulation endorsed by the original ARP 2600 inventor! For nearly 4 decades, the ARP 2600 has helped to provide the backbone for electronic, urban, and popular music. Today, musicians and producers aggressively pursue the limited number of remaining ARP 2600 synthesizers for their distinctive warmth and unmatched fidelity. The TimewARP 2600 delivers the same fat sound with twice the flexibility; at a fraction of the price of the original. This is one synth that you cant afford to be without. 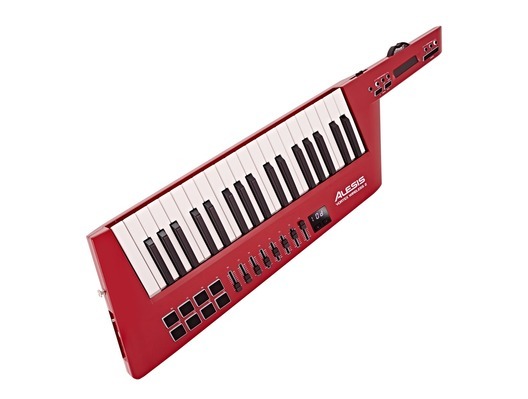 Here we have the Alesis Vortex Wireless 2 Limited Edition Red in manufacturer refurbished which will come boxed 'as new' with a 1-year warranty. Buy this amazing Vortex Wireless 2 Limited Edition Red with confidence with 100% satisfaction guaranteed or your money back!